I’m sure my family isn’t alone in verbally expressing our passion about certain foods, sometimes to the point of trying to winningly convince each other that our favorite, really is THE best food EVER! All this to say, “Pho Ga” is a definite must-have on my favorites list! Once you’ve tasted it, it’s hard not to crave this flavorful bowl of broth packed with delicious and nutritious accompaniments. What exactly is pho ga, you may be asking? 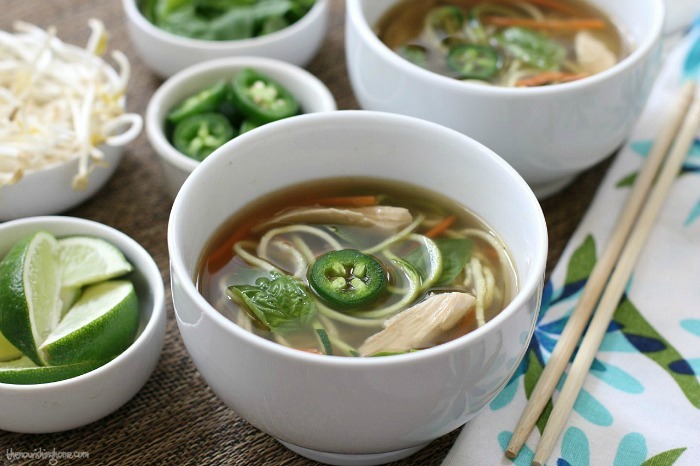 The simplest answer is … it’s Vietnamese Chicken Noodle Soup. Traditional pho ga consists of rice noodles, chicken and a flavorful slow-cooked broth, topped with fresh herbs, bean sprouts, jalapeño slices, thinly sliced onion and a squeeze of lime. 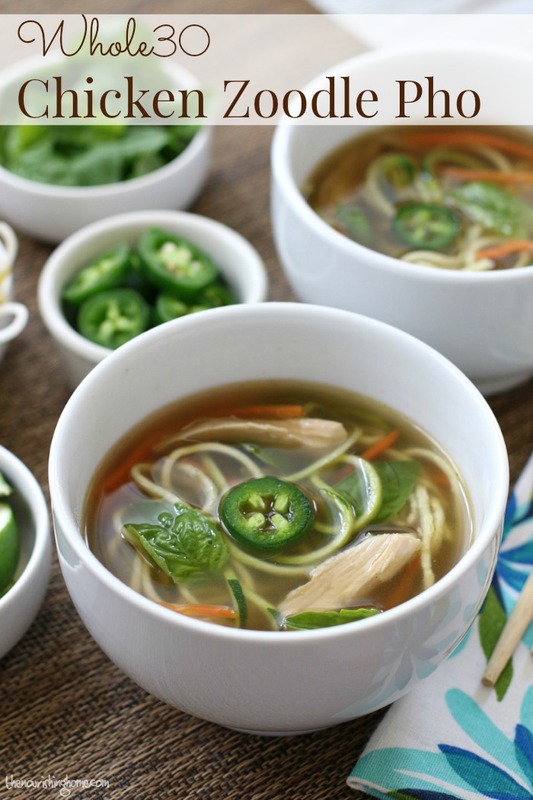 Although my Whole30-friendly version of pho isn’t strictly authentic, I do use pre-made homemade chicken broth and leftover shredded roast chicken, which greatly reduces the cooking time while still giving this soup a rich depth of flavor. Another time-saver is to double the pho broth portion of this recipe, and then freeze the extra broth in individual portions. This makes it super easy to toss the frozen pho broth into a saucepan and let it heat up while you pull together the additions. Talk about a quick-n-healthy meal! When using zoodles, there’s no need to steam them in advance since the hot broth will cook the zoodles to a nice al dente consistency in a matter of a couple minutes. This means you can simply add the raw zoodles your bowl and pull together the rest of the accompaniments while your pho broth is cooking. Then when the broth is done, you’re ready to put it all together! When it comes to pho, it’s all about the accompaniments, so don’t skimp on loading-up your bowl! In addition to the traditional favorites, I like to add a bit of raw shredded carrot and sliced green onion. 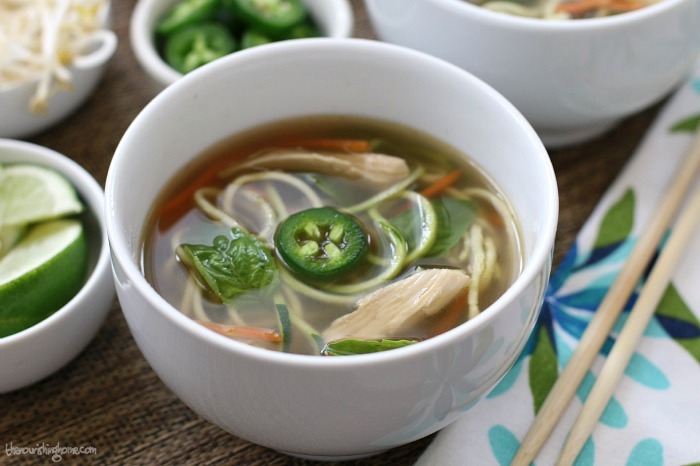 Chicken Zoodle Pho is such a symphony of flavors – the rich broth paired with fresh herbs and a squeeze of fresh lime, along with the slight heat of jalapeño slices and the crunch of bean sprouts, zoodles and shredded carrot – it really is amazing! I can’t express the joy and heartwarming satisfaction that comes from a savory bowl of pho! Enjoy! For the broth: In a large saucepan (or stockpot) over medium-high heat, add a tablespoon of olive oil. Then add the onions, ginger and garlic. Sauté just until onion starts to soften (about 2-3 minutes). Add the homemade stock, water, coconut aminos, fish sauce and whole cloves. Gather a bunch of cilantro and cut just the stems off so you have a 1-inch thick by 2-inch long bunch of stems. Add those to the pho broth. Bring broth to a boil, then reduce to a simmer. Allow broth to simmer for 15 minutes, stirring occasionally. Preparing the soup: Evenly divide the shredded roast chicken, zucchini noodles and raw carrot among four soup bowls. When the broth is done cooking, pour it through a fine-mesh strainer into a large bowl; discard the solids. Return the strained broth back to the saucepan and bring it back to a boil over medium-high heat. Once the broth comes to a boil, turn off the heat. Carefully ladle two cups of the hot pho broth into each soup bowl. Allow soup to sit 1-2 minutes to cook the zoodles and carrot, and warm the chicken. 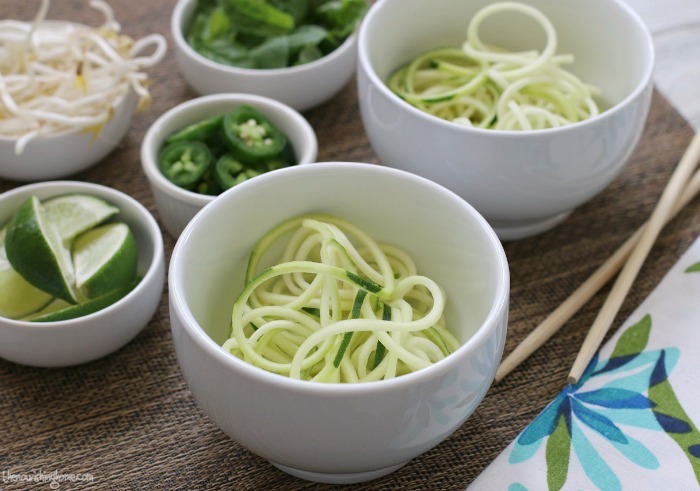 To serve: Top the soup with torn fresh Thai basil and/or cilantro, as well as bean sprouts, jalapeño slices and green onion. Finish with a squeeze of fresh lime. Stir and enjoy! So delicious! Time-Saving Tip: Double the pho broth portion of this recipe, and then freeze the extra broth in individual portions. This makes it super easy to toss the frozen pho broth into a saucepan and let it heat up while you pull together the accompaniments. Talk about a quick-n-healthy meal! This looks amazing. I cannot wait to try it.